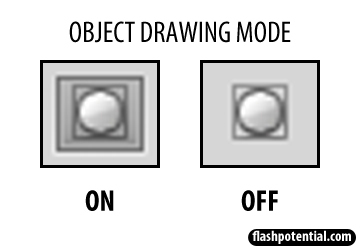 When you use the drawing tools in Flash, you have the option to draw in two modes: object drawing mode vs merge drawing mode. This article will explain a few of the differences between the two. Create a new Flash document. Select the brush tool. You can use any brush size, color and shape that you'd like. But I recommend that you choose a brush size that's not too small so that what you draw will be thicker and more visible. Also, make sure that the color you choose is different from the background color of your document. Once the brush tool is selected, take a look at the toolbar and look for the icon that shows a circle inside a square. You can click on this button, and it allows you to activate or deactivate the object drawing mode. If the icon appears to look inset, it means that the object drawing mode is ON. If not, then it means that the object drawing mode is OFF, and you are therefore on merge drawing mode instead. Clicking on this button lets you switch between object mode and merge mode. Check the object drawing mode button in your toolbar to see whether it's ON or OFF. If it's ON, then click on it to turn it OFF. If not, then leave it as is. The best way to explain the differences between the two drawing modes is to create examples. So make sure that the object drawing mode is OFF. Then draw a line on the left side of the stage using the brush tool. Now remember, since the object drawing mode is OFF, this means that this line was drawn in merge mode. Now let's switch to the object drawing mode. So this time, make sure that the object drawing mode is ON. And then draw another line on the right side of the stage using the brush tool. Immediately, you'll notice a difference. You'll see that this new line that you drew while you were in the object drawing mode is enclosed in a box. When it's enclosed in this box, it means that the artwork is currently selected. And when it's selected, this means that you can edit it (e.g. move it, change the color, modify the size). However, when you select something that was drawn in merge mode, it will NOT show a box or a border around it. In the next step, we'll see what happens instead. Now let's select the other line to see how artwork drawn in merge mode will look like when it's selected. In the toolbar, choose the selection tool (it's the black arrow). Then click on the line that you drew on the left side of the stage in order to select it. Here, you'll see that the selection looks different (click on the image above to enlarge). Instead of being enclosed in a box, you'll see dots all over the artwork. So when you see this, this means that you currently have a merge type of drawing selected. So here we see that object drawings and merge drawings look different from each other when they are selected. This easily lets us know whether something is an object drawing or a merge drawing. But aside from this, what other differences do they have? To better understand this, let's practice it using our examples on the stage. Once you release the mouse and you've selected the portion, you'll see the dots appear only on top of the part that was selected. So this means that the parts that are not covered with dots are not included in the selection. Now let's edit the currently selected portion. Go to the toolbar, and select a new color for the selected portion by picking one from the fill color box. Just click on the color box and select a different color. You'll then see that the new color only applies to the selected portion. So with merge drawings, you see that we can easily select just a portion of it. The selected portion can then be edited without affecting the rest of the drawing. You can change the selected portion's color, modify it's shape, move it to a different location, or you can even delete it if you'd like. In the next step, we'll see if we can do the same thing with the object drawing on the right. So now, while still using the selection tool, we'll try to select just a portion of the drawing on the right. 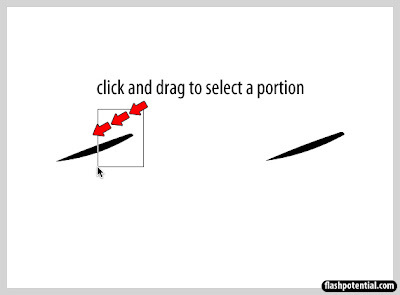 Go ahead and click and drag a selection area that just covers a portion of the shape, similar to what we did in step 7. 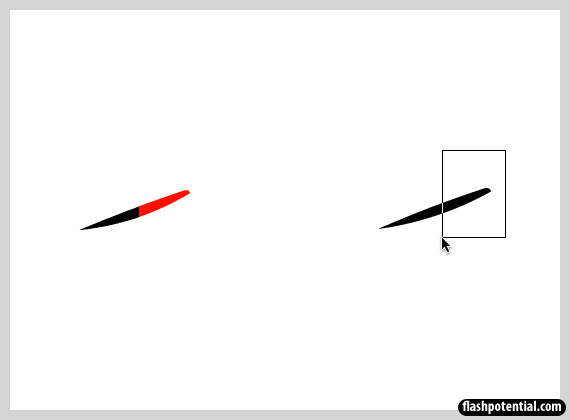 Once you release the mouse, you'll see that even though you selected only a portion of the drawing, the entire shape still gets selected. That is what happens with object drawings. As long as you select even the tiniest portion of the drawing, the entire thing gets selected. But what can you do if you've got an object drawing, but you'd still like to be able to select only a portion of it? The next step will show you how. With object drawings, it's still possible to select just a portion of the shape. There's just an extra step that you have to do. First, take note of the edit bar, which can be found above the stage. It should say Scene 1. The edit bar tells you where you are. Right now, you are on scene 1. Now go ahead and double-click on the object drawing on the right side of the stage. After you double-click on it, look at the edit bar again. It should now say Scene 1 followed by Drawing Object. What this means is that you are now inside the drawing object. You should see that you no longer have the box around your drawing. So in a way, it's as if you opened the box to get direct access to the artwork inside it. And now that you're inside the box, you'll be able to treat the artwork as a merge drawing. So you'll now have the ability to select just portions of it instead of the entire shape. Once you're finished editing an object drawing, it's important that you go back to the main scene. 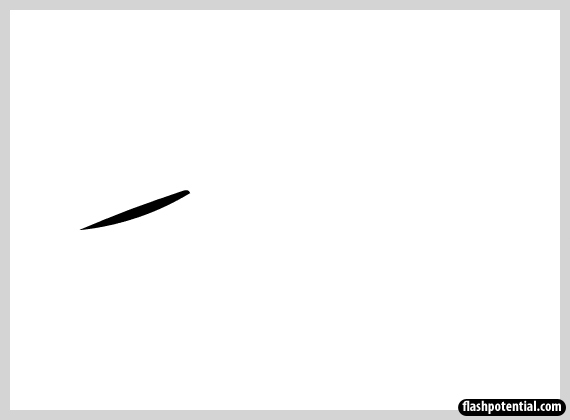 Otherwise, you might end up inadvertently adding unwanted elements to the object drawing that you're currently editing. To go back to scene 1, just click on the Scene 1 link in the edit bar. NOTE: Always be mindful of the edit bar. It's a common mistake for many to accidentally double-click on an object drawing, and then they fail to notice that they are no longer in the main scene, but continue to work as if they are. In part 2 of this series, we'll create some object and merge drawing examples using the oval tool.